This elegant personally oriented template is not only beautiful but also very functional. The vast array of customizations is just excellent, giving you more control on the look and feel of the theme without having to dig into the theme editor (and PHP / HTML / CSS code). Multilingual support: In our templates all wordings of both back-end and front-end are moved to separated language files, so you can easily translate them into any language you want. Built – in SEO options: Great built-in SEO techniques which help you improve your website visibility to search engines, including SEO for Source Ordering, Website Title and Top H1 tag. Personal colorful tastes with orange, red, cyan, green, yellow, and pink. Comprehensive text and video materials for product configuration and customization. JSN Dome template is equipped with the detailed documentation package including the Configuration and Customization manuals. You can download it at here. 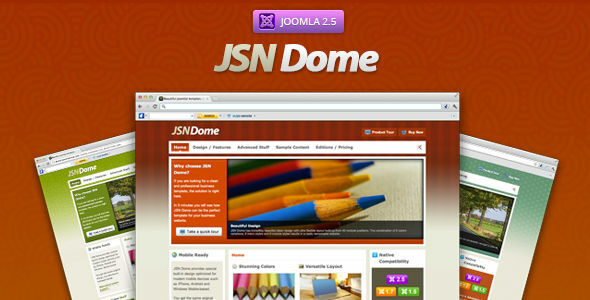 JSN ImageShow, JSN PowerAdmin and JSN Uniform are three built-in extensions in JSN Dome sample data. 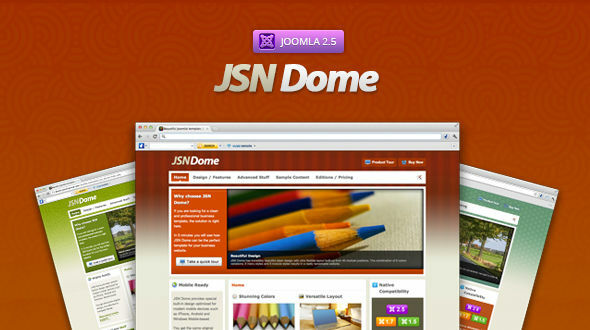 JSN ImageShow is the first Joomla! image slideshow that displays your images in a lively and truthful way. It can be placed on any website, in whatever size and filled with whatever content you want. JSN ImageShow now provides you with 6 amazing themes: Theme Classic, Theme Slider, Theme Grid, Theme Carousel, Theme Strip and Theme Flow. More themes will be released in the future. JSN PowerAdmin makes your Joomla administration process easy and enjoyable. It allows you to have full control over your Joomla website in a single screen. You can manipulate elements by using an intuitive GUI with drag-n-drop operations. JSN PowerAdmin supports 10 languages: English, German, Dutch, French, Russian, Spanish, Portuguese (Portugal), Portuguese (Brazil), Polish and Japanese. “I was diagnosed as addicted to HTML , Style sheets and Perl. After resisting for a while I was admitted to a Joomla! clinic. I received JSN templates for a full week (one a day). Fortunately the treatment was successful and I am cured. Thanks God! Thanks to people at such a wonderful manufacture of truly professional templates. ^ Updated override com contact. # Fixed a bug with update, upgrade and install sample data on template when use EU e-Privacy Directive extension. # Fixed a bug Duplicate the title tag on offline.php file. # Fixed a bug calendar display. # Fixed a bug Contact form on Joomla 3.0 broken when run on IE browser.